The corridors and the gardens of the Royal Foundation of Saint Katharine in Limehouse have an interesting collection of sculptures, paintings and other works of art. Two in particular caught my attention while I was staying there this week for a residential meeting of the trustees of the Anglican mission agency USPG (United Society Partners in the Gospel). 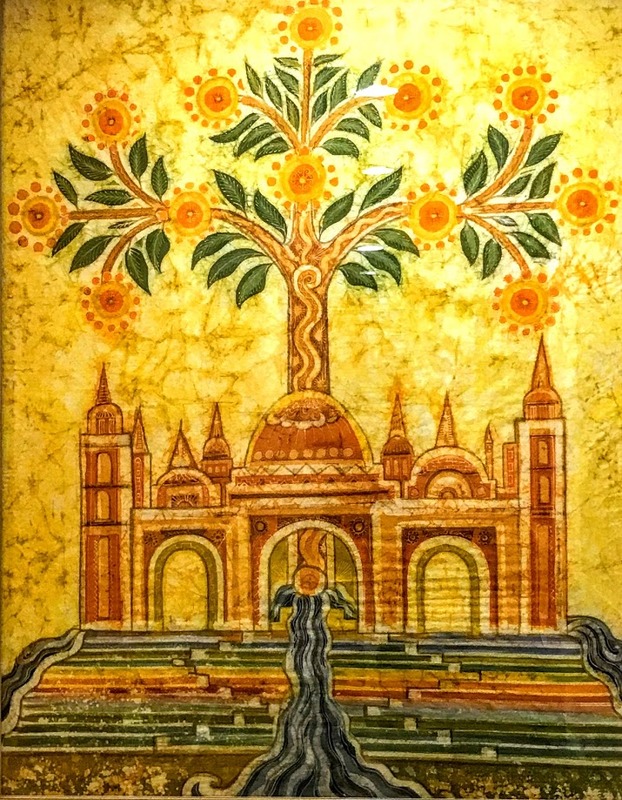 ‘The Holy City’ is a colourful picture by Thetis Blacker (1927-2006), a distinguished artist in the complex work of batik, which originated in south-east Asia, and is produced by waxing and dying fabric. Ann Thetis Blacker was noted for her richly coloured pictures. She was born in Holmbury St Mary, Surrey, the daughter of Carlos Paton Blacker, a psychiatrist, and a granddaughter of Carlos Blacker, a friend of Oscar Wilde. She intended to be a singer and studied in London with the German mezzo-soprano singer Elena Gerhardt. She appeared in the chorus at Glyndebourne opera in the 1950s and sang the role of Mother Goose in the Rake’s Progress by Igor Stravinsky. When her singing career was cut short by vocal issues in the mid-1950s, Blacker turned to painting. At the Chelsea School of Art she was taught by Brenda Moore, wife of the artist Leonard Campbell Taylor. Blacker became a Churchill Fellow in 1970 and visited India, Indonesia, Iran, Malaysia, Singapore, and Thailand. She worked at the Batik Research Institute in Yogyakarta, Indonesia, and visited Bali and Peru, influencing her style of brightly coloured symbolic pictures using batik dyed fabric. A number cathedrals and churches in Britain, Europe, and the US commissioned her work including a series of five major pieces based on mythical themes: Apocalypse, at Saint Andrew’s House, Arbor Cosmica, A Bestiary of Mythical Creatures, The Creation, at Winchester Cathedral, and Search for the Simurgh. She also received commissions for Saint George’s Chapel, Windsor, with an exhibition in 2000; St Albans Abbey; Grey College Chapel at the University of Durham; and Durham Cathedral. These works in cathedrals and churches also include altar frontals and clerical vestments. She died in Bramley, Surrey in 2006. I saw the Holy City, new Jerusalem, coming down out of Heaven from God. The city did not need the sun or the moon to shine upon it for the glory of God gave it light. 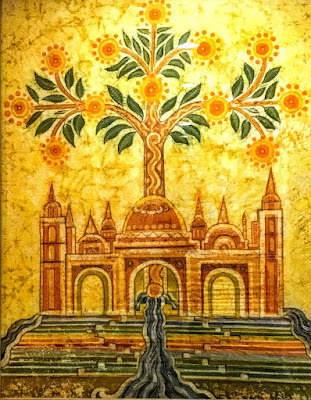 The river of water of life, sparkling like crystal, flowed down the middle of the city’s street from the throne of God and on either side of the river stood a tree of life. The leaves of the tree are for the healing of nations. 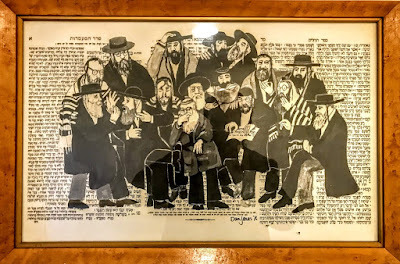 In the week after Holocaust Memorial Day, it did not take a big leap of imagination to make a connection between an image of the New Jerusalem and images of the old Jewish population that once lived in this part of the East End. On the same corridor, a work by the Cable Street artist Dan Jones recalls the Jewish life and culture that was once associated with the area around Cable Street. Dan Jones’s mother, the artist Pearl Binder, came to live in Whitechapel in the 1920s, and since 1967, he has lived in Cable Street where he was brought up his family in an old terraced house next to the Crown and Dolphin. He was first employed in youth work in the Cable Street area, and later he was involved in social work with immigrant families. He is a prolific painter, and his works are always exuberant and playful. He has been a popular figure in the East End for many years, and his canvases are crammed with affectionate portraits of the people he has come to know through his work and political campaigning. His work is usually pointedly political, dealing with themes such as combatting racism and celebrating the interfaith and multicultural dimensions of life in the streets close to Saint Katharine’s, including Cable Street, Brick Lane, Petticoat Lane, Commercial Road, Watney Market and other parts of Shadwell, Stepney, Tower Hamlets, Wapping and Whitechapel. He also produced a series of smaller pictures to illustrate two books of Nursery Rhymes, Inky, Pinky, Ponky and Mother Goose comes to Cable St, both published in the 1980s. In recent years, he has undertaken a series of large playground murals portraying school children and the infinite variety of their games and rhymes. Today, Dan Jones works for Amnesty International and he continues to paint as well as pursuing his lifelong passion for collecting rhymes.